Introduction: “Richard ΠΙ with aliens” is how Cornell (102) describes “Sins of the Father,” an episode of Star Trek: The Next Generation (hereafter TNG) in which the Klingon warrior Worf, son of Mogh, seeks to restore his family’s honour by exposing and challenging those responsible for falsely accusing his dead father of treason to the Klingon Empire. 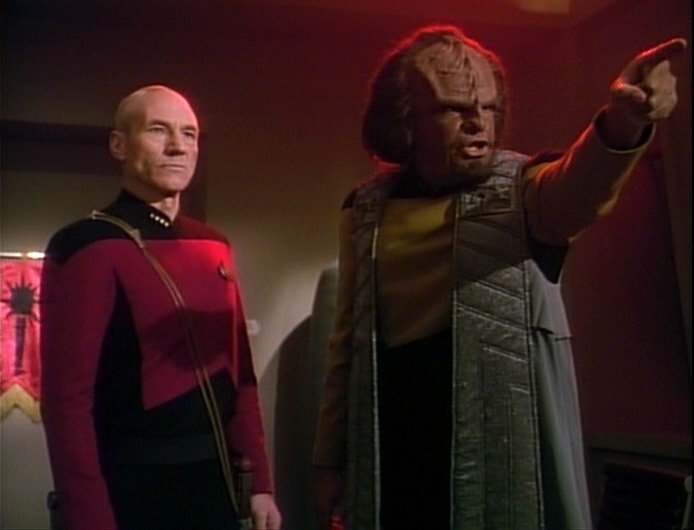 Worf is only partly successful in his quest, and he remains a perpetually marginal figure whose identity is divided by his Klingon heritage, his childhood as a Klingon orphan raised by humans., and his current status as the only Klingon in Starflect, the military arm of the Federation of Planets, an alliance of Earth and other worlds whose relationship with the Klingon Empire is marked by tension, suspicion and, at times, open hostility. As a result of these divisions and struggles, Worfs family is e’ventually stripped of its wealth and rank on the Klingon home-world, and Worfs brother Kurn seeks a ritual death as the only way to absolve his own and his family’s disgrace. Historical and cross-cultural motifs are common in TNG, and resonate throughout the secondary texts that have sprung up around the television series— comics, reference books, novelisations of the TV episodes, fan conventions, and numerous Internet sites where devotees debate the minutiae of an imaginary future. What these motifs point to is the intertextual nature of popular culture, the ways in which mass-mediated images are constructed through the recombination of elements that are already embedded in the cultural repertoire—traits, stereotypes, narrative themes—and already resonate with some degree of familiarity and recognition. Representation is the process of selecting these elements, displacing them from their existing contexts, simplifying and condensing them to fit new contexts where they are reconnected in ways that produce new meanings and pleasures, new identities and identifications. The source of these elements is limitless, and the process of selecting and recombining them is often indifferent to the original contexts in which they are found. Popular media culture poaches from high culture as well as from itself; it can be as promiscuous in its use of established fields of knowledge—science, history, art— as it is in its appropriation of the experiences and understandings of everyday life. All media images, whether they are fictional or ‘real,’ are in this sense discursive composites, an effect of the displacement, condensation and inventiveness of representation.